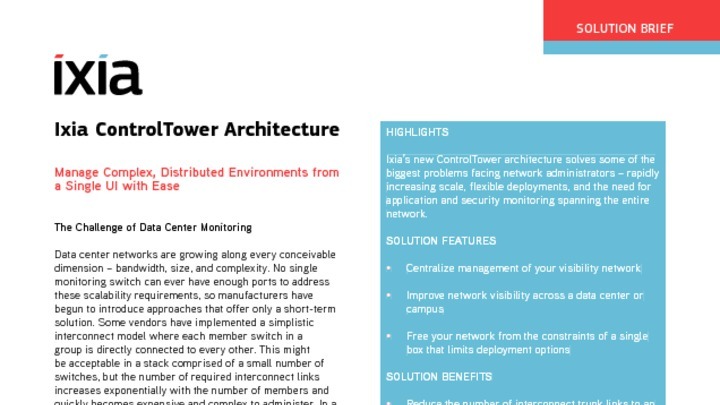 Ixia ControlTower™ is a network visibility architecture for centralized, intelligent monitoring. It solves some of the biggest problems facing network administrators: increasing scale, flexible deployments, and the need to monitor the entire network. It helps you easily scale and rapidly deploy multiple segments for centralized, intelligent monitoring. Top-of-rack or end-of-row deployment in scalable, flexible data centers, such as cloud-hosting centers with their extreme need for flexibility and scalability. Ixia ControlTower™, like an airport control tower, gives you a total view from far above the traffic and enables you to maintain complete visibility of your network. Place a member at the top of each rack or end of each row, collect relevant traffic, and bring it back to the monitoring tool farm for inspection. In enterprise campus environments, IT needs to extend visibility into several buildings and not just be concerned with the perimeter of the central data center or internet access point. Advanced Persistent Threats may be deep inside the network, in any building, accessing corporate information such as product designs or pricing data. Ixia's ControlTower™ is the ideal cost-effective architecture to enable network-wide visibility. Its tool-farm approach maximizes monitored segments while minimizing the number of interconnect trunk links. Ixia ControlTower™ architecture supports a centralized data center high-port-density solution: stack multiple members in a single location and treat the stack as a single, large chassis. This flexible solution offers the port density and ease of management of a single-chassis solution, but with no change in administrative overhead if needs change and some of the visibility ports must be deployed in a remote equipment rack or building.